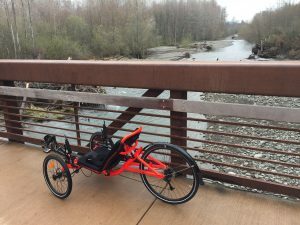 I was up on the Olympic Peninsula this week, and on a whim, I decided to go for a ride on the Olympic Discovery Trail from Sequim west to Port Angeles. Since I didn’t have a trike with me, that meant renting one from Ben’s Bikes in Sequim. This fine bike shop has an unusually large selection of trikes, including the Catrike 559, which happened to be what was available for rent. Catrike has an interesting back story. Paulo Camasmie was a young Brazilian mechanical engineer living in San Paolo in the late 90’s, when he had an epiphany on seeing an American comfort bike: he could design and build a better bike, with three wheels! He moved his family to Orlando, Florida and began the process of developing a new trike, lighter and better than what was then widely available. He ended up with a welded aluminum, highly engineered “space frame” which became the Catrike trademark. From one man in a garage the company grew to its current size, with annual production of over 3,000 trikes and a very loyal customer base. Continuous improvements through Lean Manufacturing principles have resulted in a high-quality product at a relatively affordable price. I set off for a 24 mile ride west on the ODT, hoping to finish before the rain set in. The 559 impressed me immediately. It was lightweight, agile, and smooth, especially considering the lack of a suspension. Riding through beautiful farm, woods and river terrain, I got the usual thumbs-up and friendly waves from other trail travelers, and was able to beat the rain (which set in moments after I turned the trike back in to Ben’s).